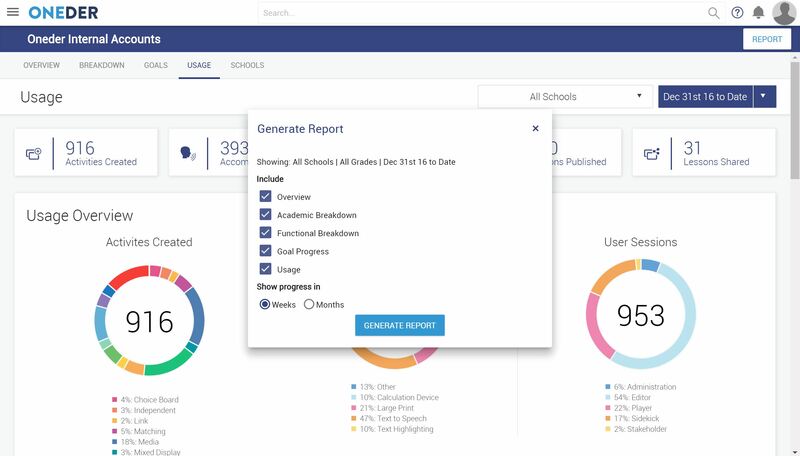 The ONEder Stakeholder Portal is a convenient reporting dashboard where district and school administrators such as Principals, Superintendents, and SpEd Directors can view a variety of easy-to-read usage, student progress, and staff activity reports. The first thing you will see upon logging in is the Overview tab. 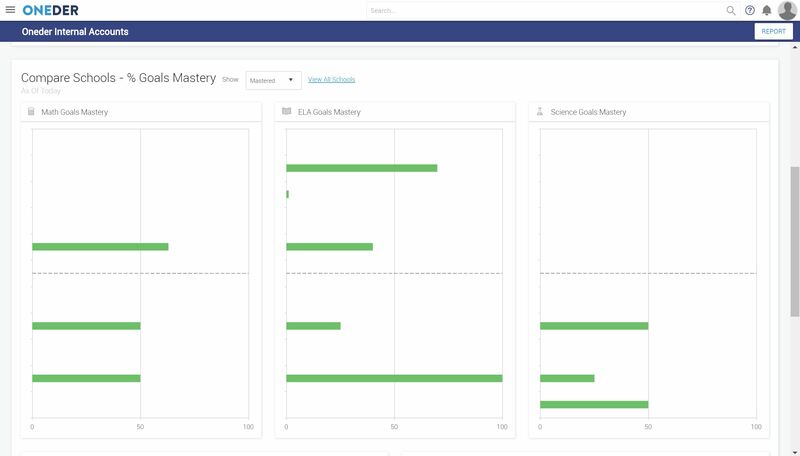 The Overview provides high-level reports showing progress toward Math, ELA, Science, and Functional goals at both the district and school levels. 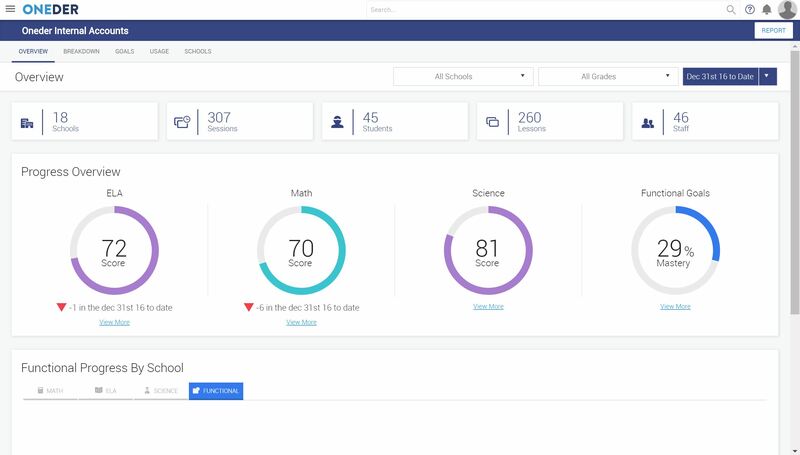 You can use the use the buttons in the upper-right corner of the screen to filter this information by School or Grade, as well as setting a specific date range to include in the report. The Breakdown tab allows you to see a more detailed report about progress on specific academic strands or functional domains. 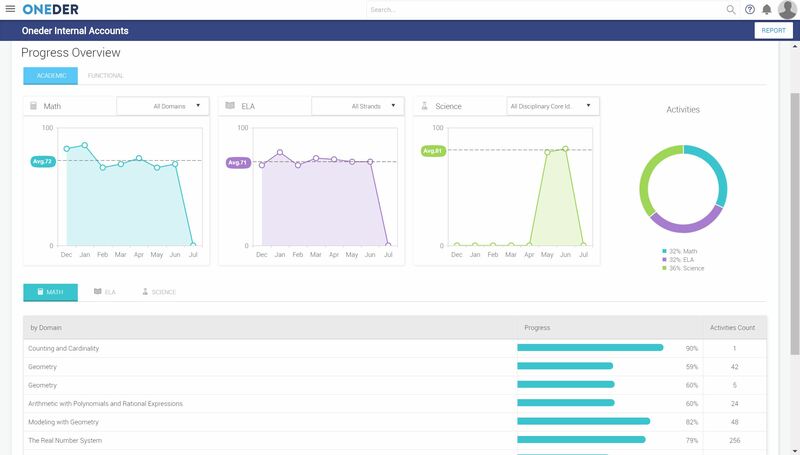 The Progress Overview graphs at the top of this screen will allow you to view progress over time, and the Math, ELA, Science, and Functional graphs each have a drop-down menu that allows you to filter your view by a single strand or domain. 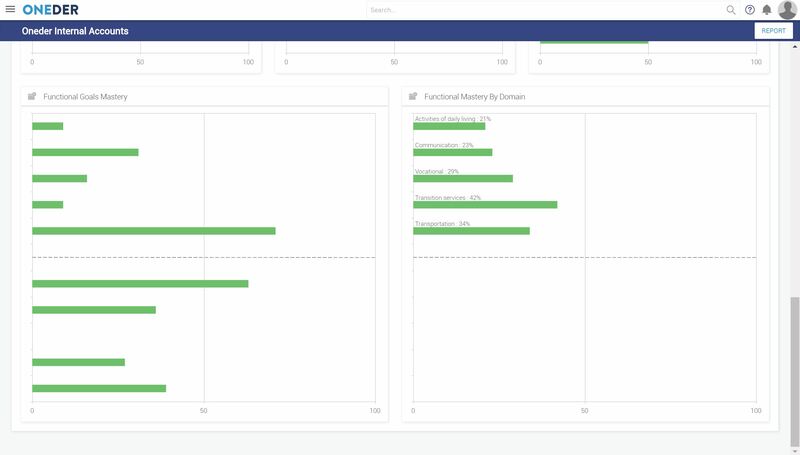 The bar graphs at the bottom show cumulative progress information on all strands and domains, indicating total progress as well as the number of activities that have been used in each strand/domain during the specified time range. 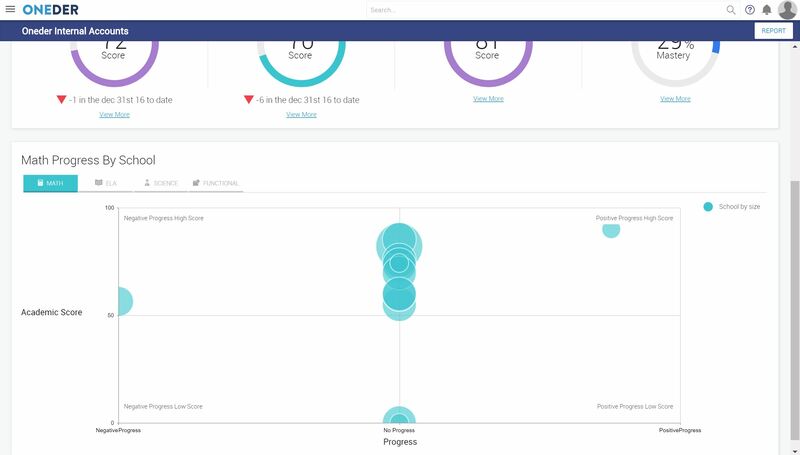 The Goals tab shows progress at the goal level, with the Goal Mastery Progress section at the top of the screen indicating the number of goals that have been mastered, are in progress, have shown no progress, and haven’t been started yet. This information can be displayed in both total number and percentage formats, and functional goals can be further filtered by domain. 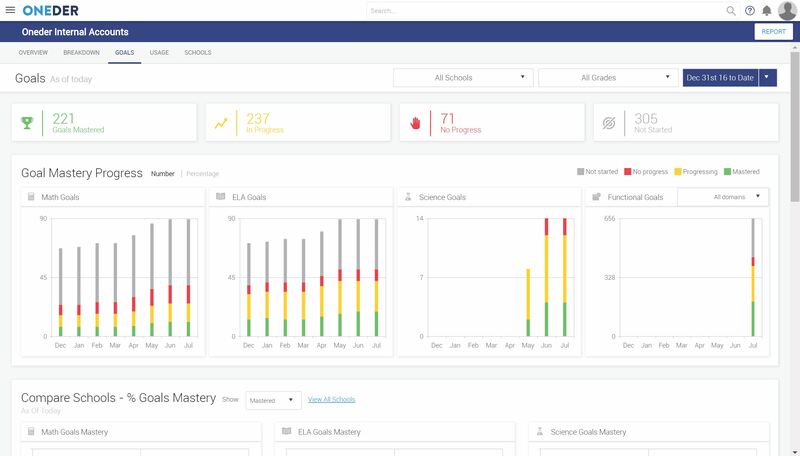 The Compare Schools – % Goals Mastery section in the lower half of the screen allows you to compare mastery rates between different schools within your district. As with the Goal Mastery Progress graph, this data can be filtered according to different mastery levels. Finally, the Usage tab provides information about how many people in your district are using ONEder, how often, and what they’re doing while logged in. 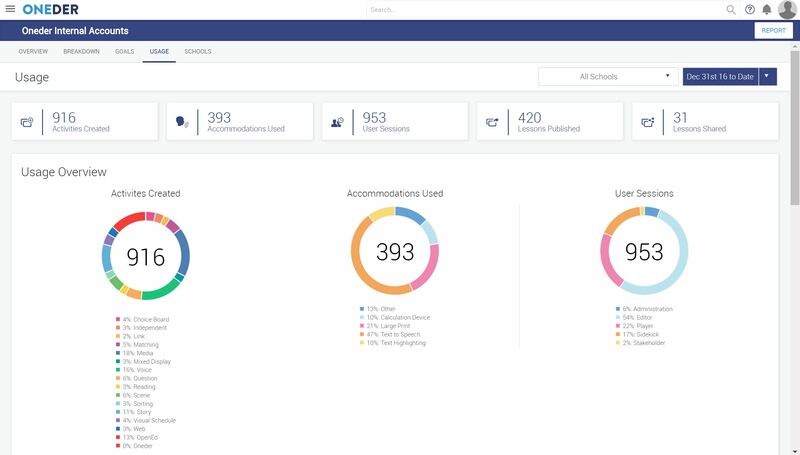 The Usage Overview section will show you both the total number and percentages of activities that have been created, the accommodations being used to support students, and the number and types of user sessions that have been recorded. 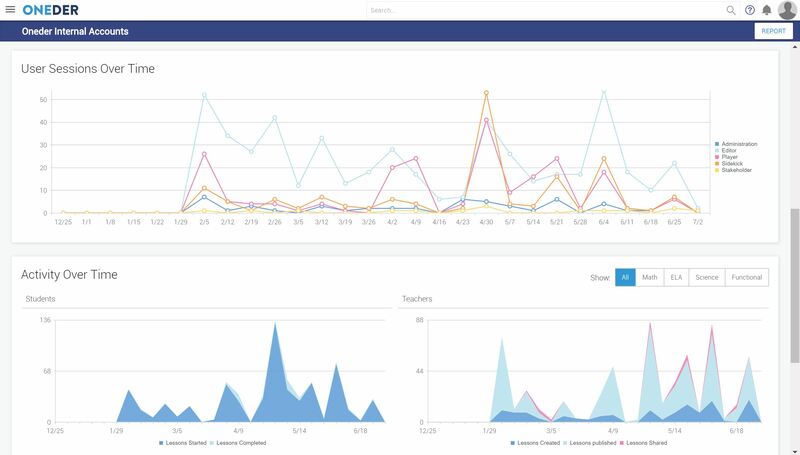 The lower sections of this tab include graphs displaying usage over time, including the number and types of user sessions, lesson and activity creation and usage statistics. The REPORT button in the upper-right hand corner of the screen allows you to generate a PDF report containing the information shown in the Stakeholder Portal. Before the report is generated, you will be presented with a menu to choose which information you want to include in the PDF, and whether you want the information to be broken down by week or month.